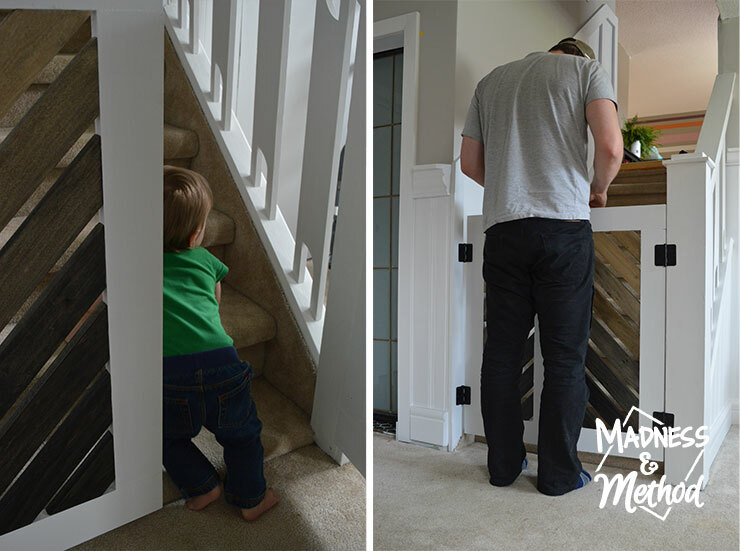 This rustic saloon style DIY baby gate is the perfect solution to prevent baby from going up the stairs when you don’t have a lot of door swing space. Ever since the little man has been able to crawl around, we’ve been hanging out in the basement. It’s a completely carpeted space, his toys are setup down here, and it’s newly updated too! Actually, our computers are downstairs… so he kind of has to be near me when I’m working :) I just installed a saloon style DIY baby gate, so now falling up the stairs is one less thing I have to worry about! It seems like before the little man could even sit, he taught himself how to climb the stairs. We would always be right behind him, but obviously we kept a tension baby gate up for the times when we didn’t want him going up. Problem was, that gate was ANNOYING to setup. And you’d think once we set it up, we’d be good for at least an hour right!? Well… enter Tootsie. She could never decide if she wanted to stay with us, or go upstairs. Or whatever. What about when we needed to go grab something upstairs quickly? You had to place the gate in the perfect spot to get it tight, and I was really the only person who could do it right. 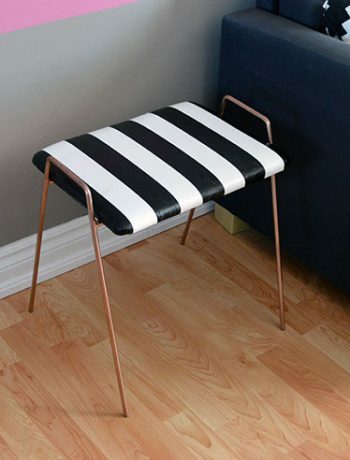 Oh, and it had to be low enough too so that the mister wouldn’t crawl under it (see the photo above – way too high!). Another annoying thing? 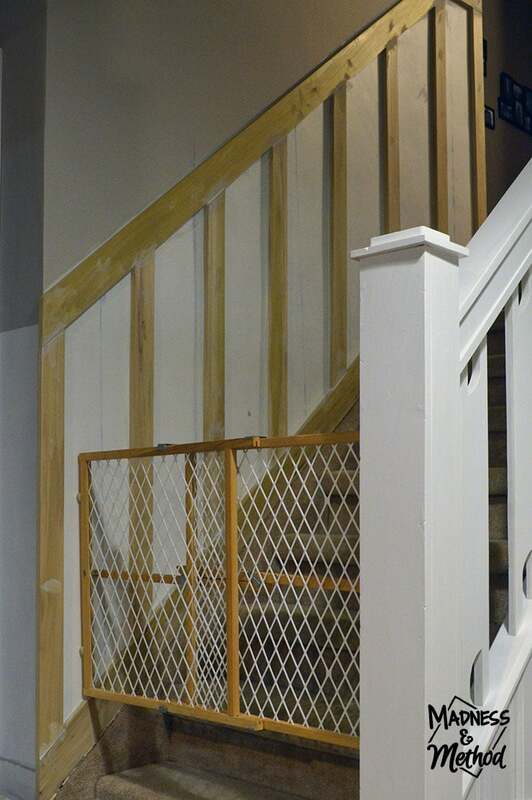 Whenever I took the gate down, we’d put it next to the stairs. There was a metal piece that always banged against our railing (my fault) and it was starting to mark the new white paint (that took forever to do remember!?). 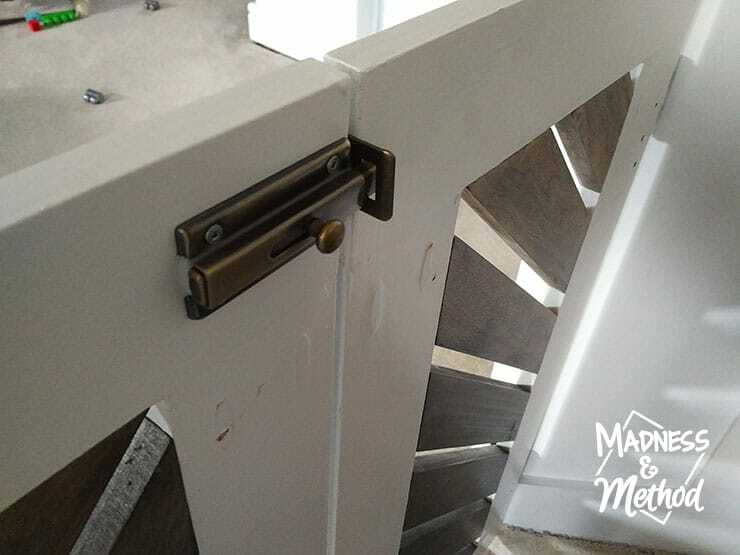 I actually had leftover Metrie poplar flat stock from our board and batten stairs and was planning on building a normal sized baby gate for the top of the stairs. 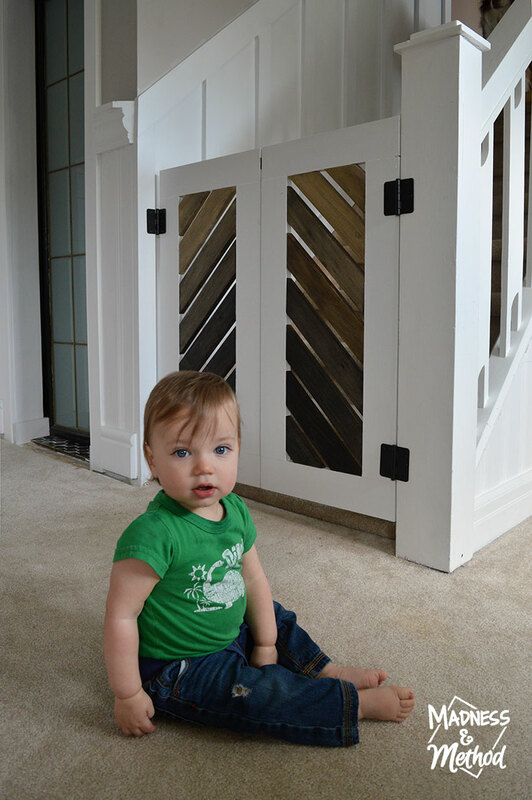 However, after living with a crawling baby for a few months, I realized that we needed one downstairs first. I didn’t want something that would swing open and block the pathway (either on the left to get to laundry room/bathroom, or the right to get to our desks). I knew that a gate that would swing open in the middle, ie: two skinny doors, wouldn’t block the path too much in either direction. AND it might even be easy to open one of the doors and let Tootsie in. 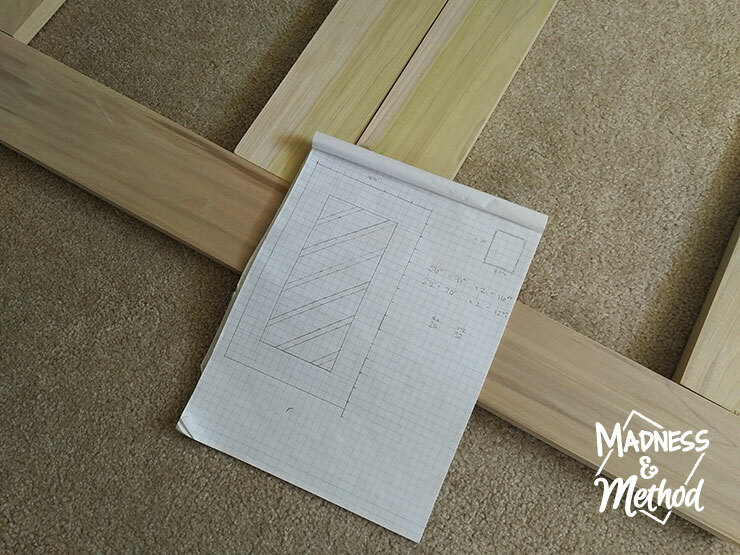 After measuring my opening area, I drew up a simple door that would incorporate both the 3-1/2″ poplar flat stock and 2-1/2″ poplar flat stock that I had. 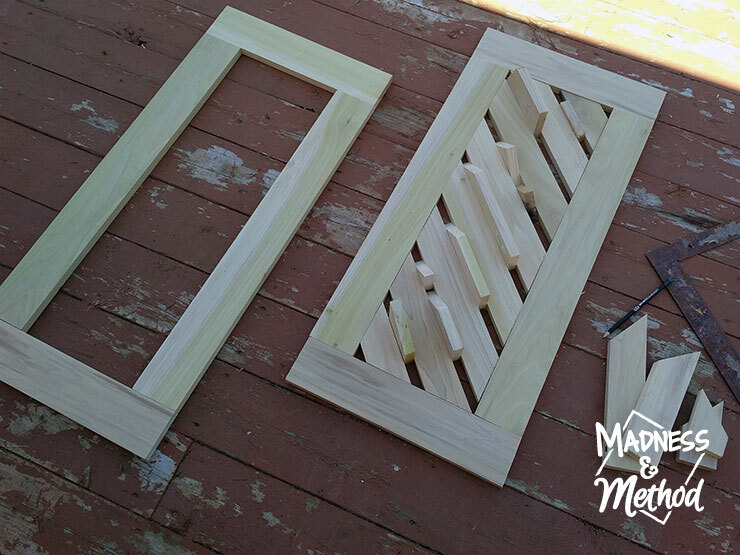 I used the wider pieces to create an outer frame, and attached them together using my Kreg Jig pocket hole tool. Misstep Tip 1: If you want to hide your pocket holes, make sure to do it before you finish your piece! 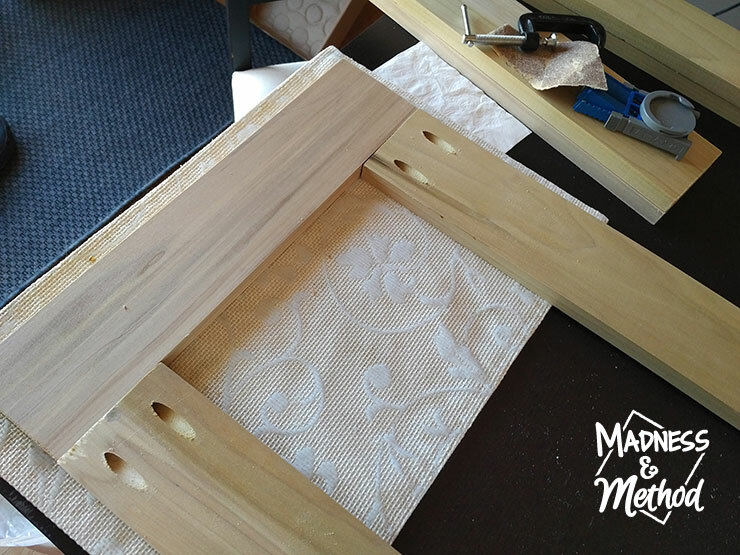 Once my outer frames were attached together, I made sure they fit in the opening (just in case I measured incorrectly!). 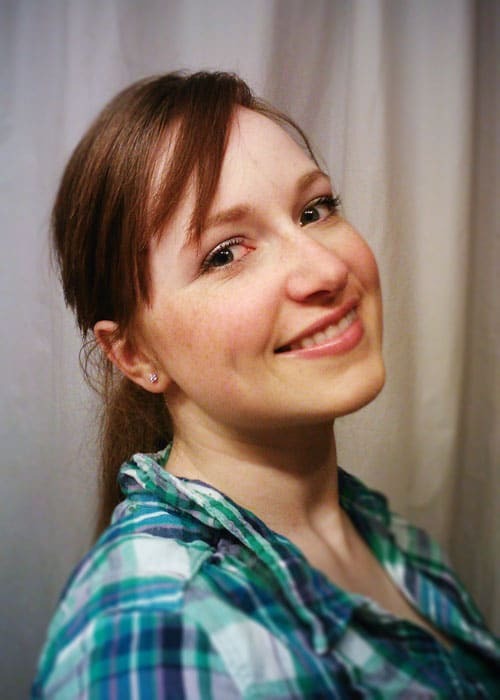 I actually did test them in place, but couldn’t hold them up and the camera at the same time haha! 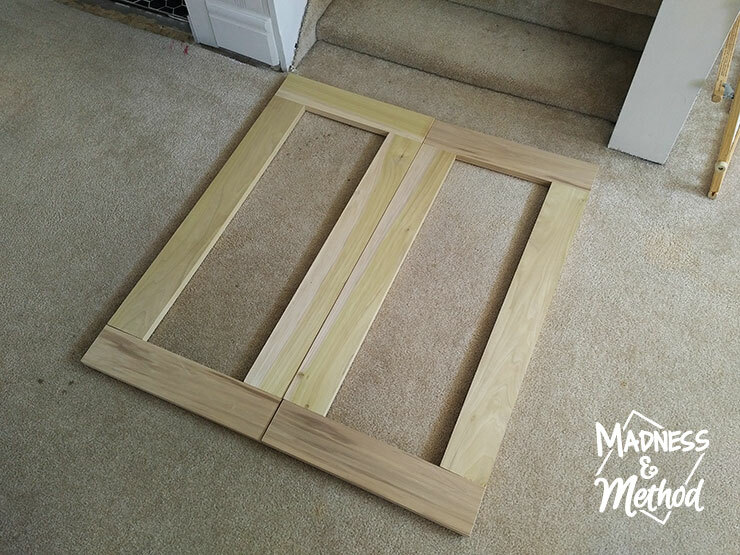 Real Misstep 0: Okay, I actually forgot to account for the width of the boards when I was doing my height pieces, so they were 7″ taller than I originally planned. I realized it when I went to attach them together, but they fit and looked good so I kept them tall. From there, I used the smaller pieces to do diagonal sections. I was going for a cool look, rather than to a straight across pattern (or whatever else). I used the thickness of the boards (3/4″) as my spacers. I then mirrored all the pieces for the other side, and was happy with the way it was looking so far! I actually marked the edges of every single piece so that I could match it up later. I didn’t attach the pieces together yet because I knew it would have been a hassle to paint all the little grooves when there was limited space. 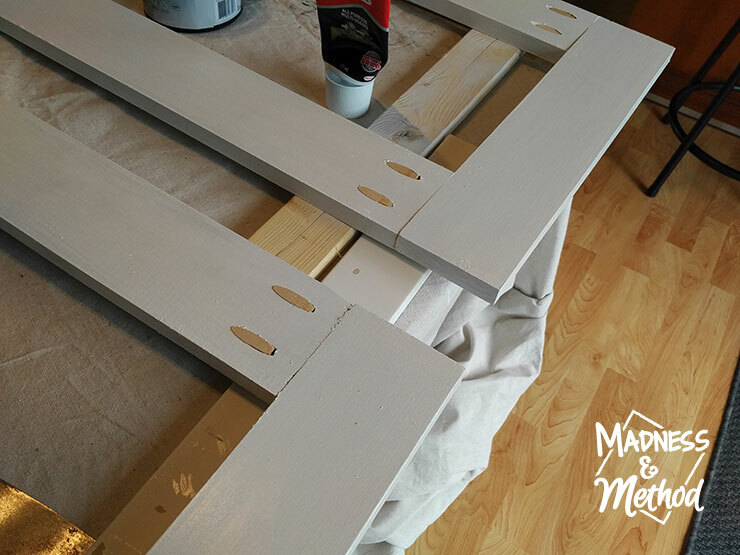 I sanded everything and gave the outer frame a couple of coats of white paint. 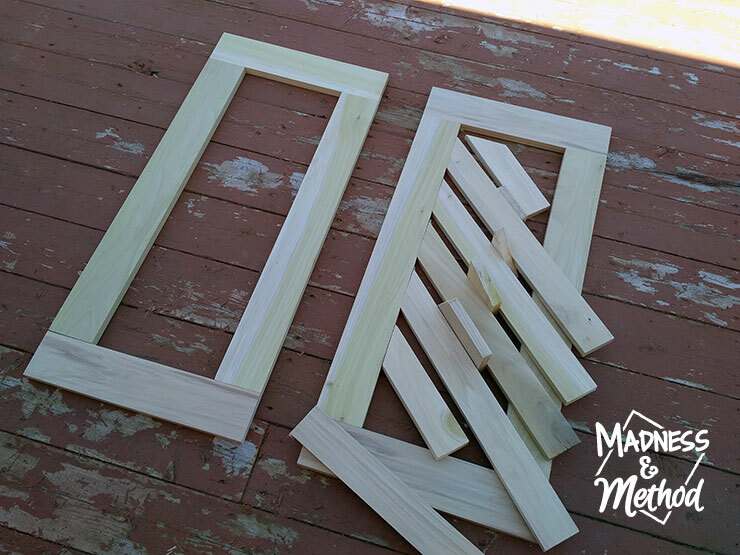 Before I painted the inside diagonals, I showed the Husband the progress so far (and by showed, I mean he saw everything laying on our dining room table and was wondering what was going on). 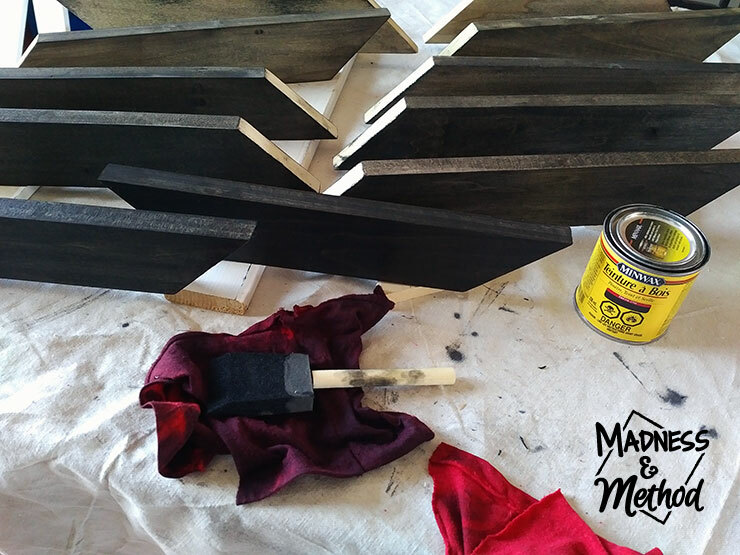 I hadn’t painted the inside diagonals at this point, so I decided I would stain them instead! I figured that if I didn’t like it, I could just paint over them later, so it wouldn’t be a big loss. 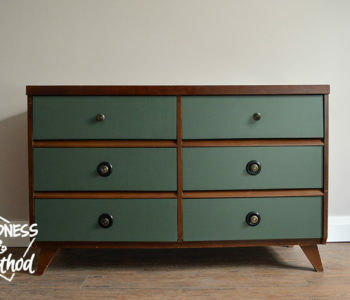 But if I’m going to stain something, I’m going to use a colour I like (and had on hand already!) – Minwax Ebony. I was going for a cool black and white thing, BUT then decided to do an ombre look. 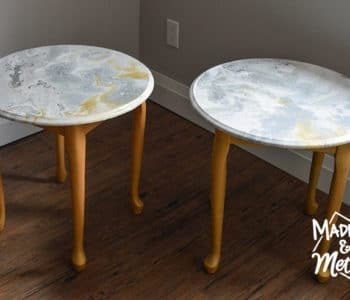 Again, if I didn’t like it, I could just stain them fully dark. 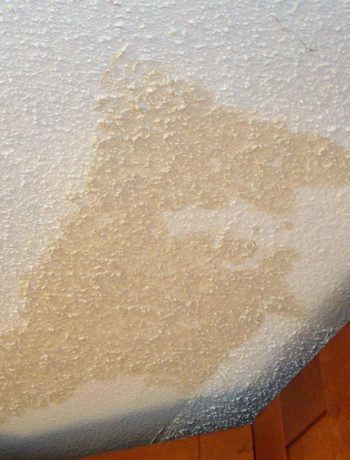 It was actually SUPER quick to do (like WAY faster than painting) because the poplar took the stain so well. Finally I gave the outer white frame a coat of Polycrylic, and once everything was dry I finished assembling. To attach the inside diagonals, I started from the bottom pieces and worked my way up. 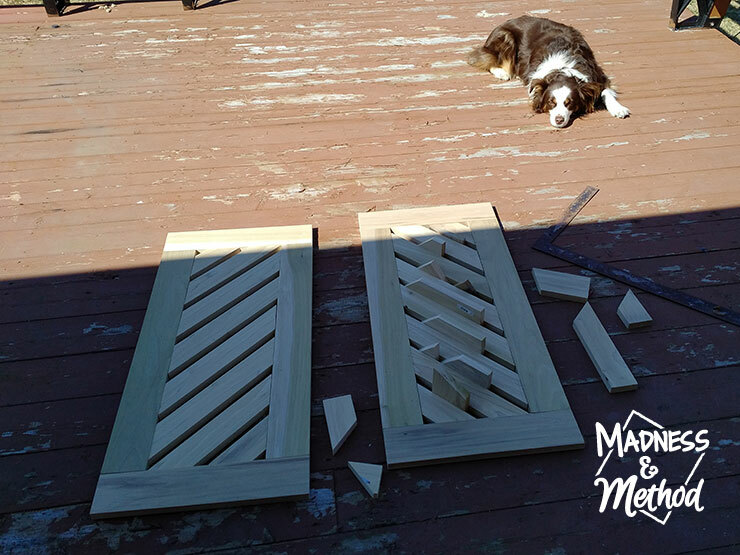 I knew I would only be able to get nails in a few pieces before I ran out of room for my nail gun, and figured that the bottom ones should be more secure (that’s where the baby is and all!). 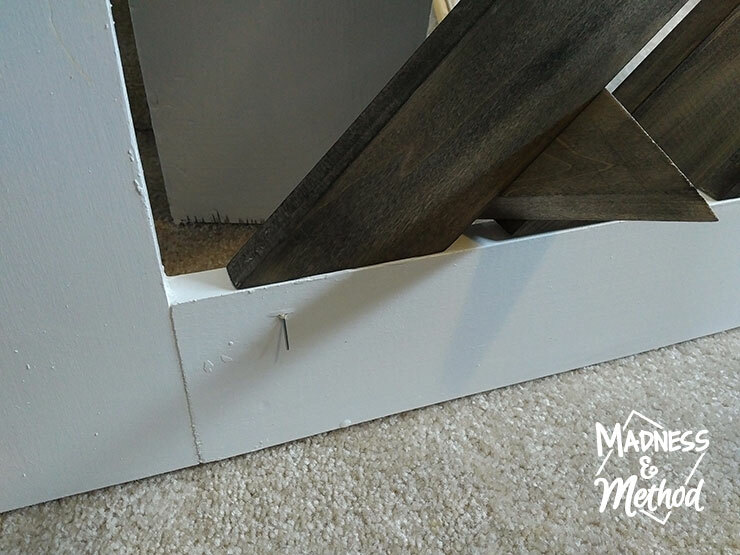 I would add some No More Nails to the inside edges, put a nail in the part that I could, and clamp the other side for 15-20 minutes. Then I moved on to the next board, and so on. 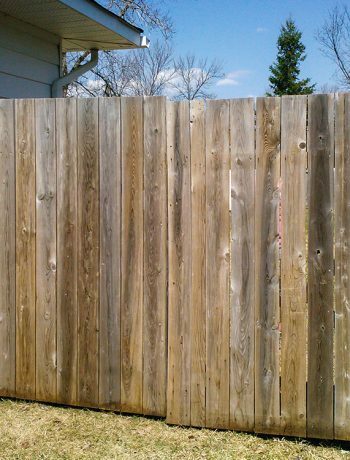 There were a couple of spots where I tried manoeuvering the nail gun into, but I ended up going through the wood…. ahhhhh! Tip: Attaching the diagonal pieces was definitely tricky, so maybe thing of a different pattern haha! Once all the glue was dry, I clipped the nails that were sticking out and gave everything another coat of poly. 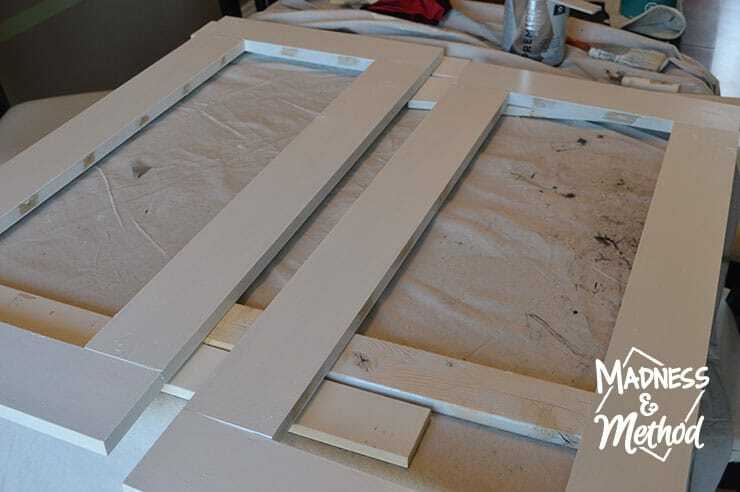 Tip: You’ll definitely want to figure out a mounting plan BEFORE you start building your doors. There are different types of hinges available, and the ones you get depend on where/how they are installed. The original idea was to have the hinges hidden in the back (ie: where the stairs are) but I had to alter my plan when I realized how doors work. 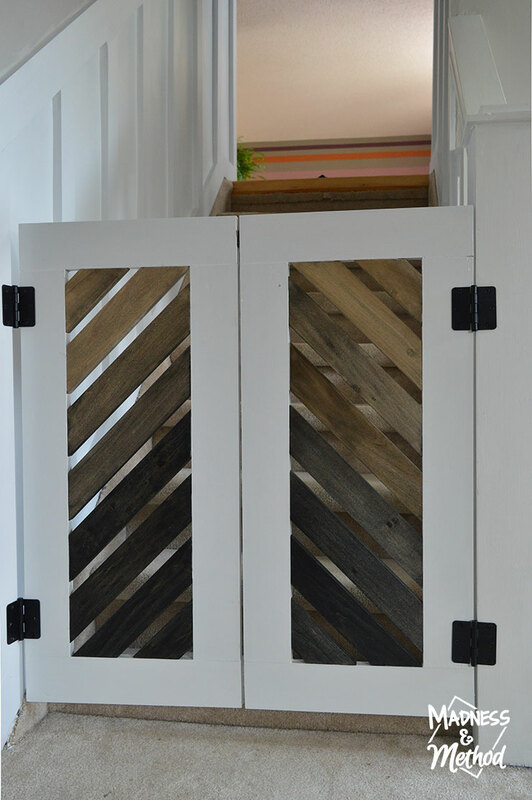 The photos above show how far the saloon style DIY baby gate doors swing in each direction, just in case you were wondering! BUT the really magic is how cool they look when they’re closed right!? 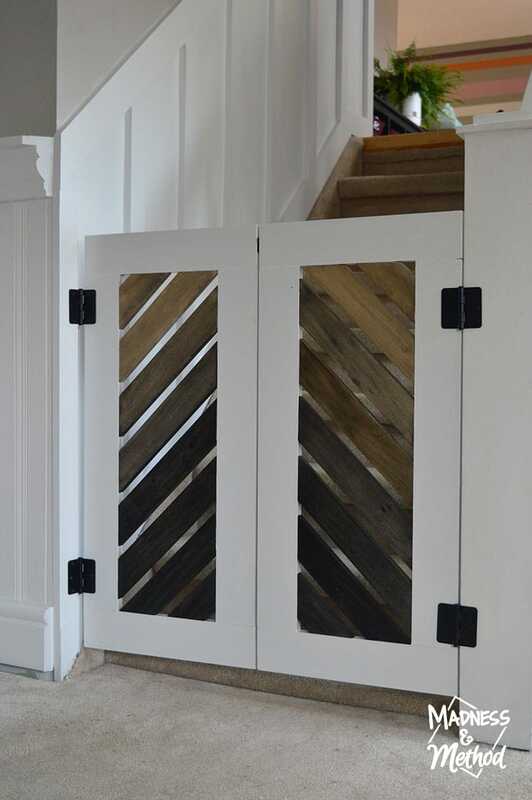 Ha, it was actually the Husband that chose the way the diagonals faced (ie: pointing upward or downward) because he said it looked like a cool saloon door this way. (Which is how I came up with the name for this project haha!). 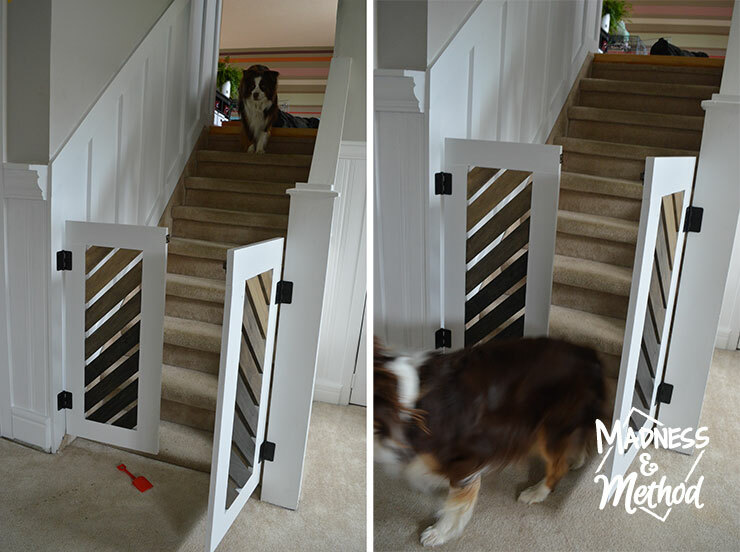 Anyways, you would think the mister would be all excited to check out his new baby gate (and you know, pose for Momma) – but no, he didn’t want anything to do with it at this point. Thankfully we have another cooperative child (right at the top of the steps there). 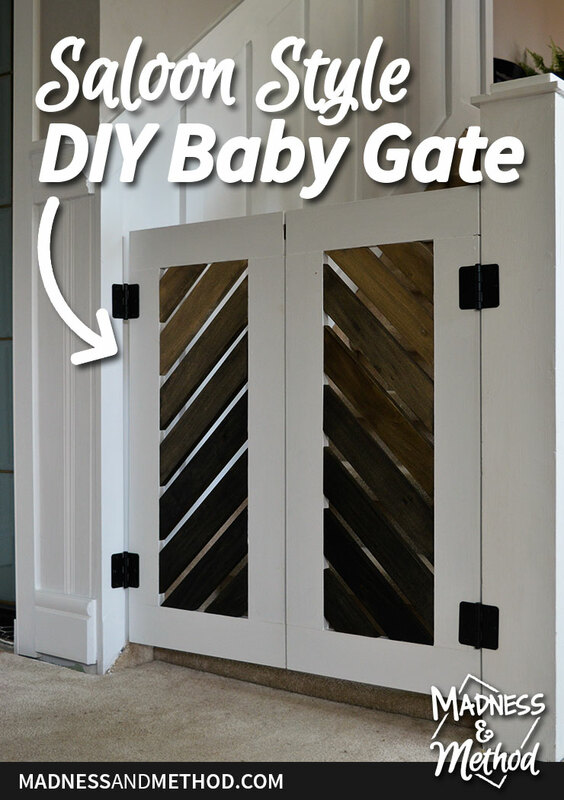 At least the saloon style DIY baby gate looks good on its own! I’m happy I decided to go with the Husband’s idea to highlight the wood, and the ombré looks really good. If it was all white, it would have probably blended in too much. And I took a photo of the Husband’s bum to show the scale of the gates, in case you were wondering. And obviously as soon as I open them, the mister will gladly try and escape! 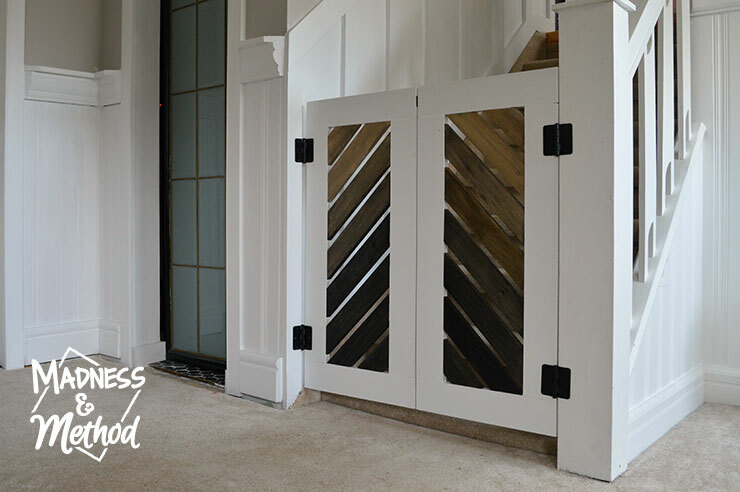 What do you think of our saloon style DIY baby gate? 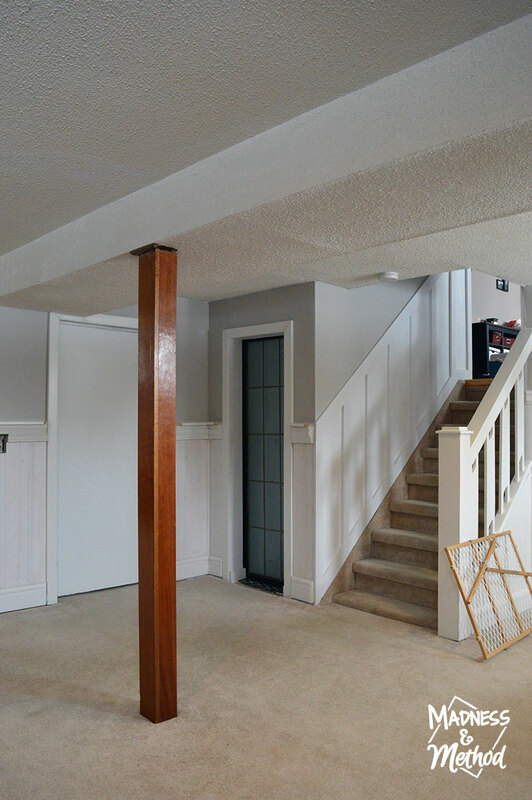 It’s a bit more rustic than what I normally go for, but it totally matches the look of the basement.